Athson is the main character of The Bow of Hart and a rather complex one at that. He suffers from fits over the violent memories surrounding the sack of his home Depenburgh that left him an orphan. These events were precipitated by an attack of trolls who are commanded by Corgren, a wizard in service to Magdronu, a dragon seeking for prime control of the world of Denaria. After elves discovered Athson wandering in the Auguron Forest they took him in only to realize later that he suffered the aforementioned fits as well as hallucinations about a Mountain Hound he called Spark. But over the years, these affects have been muted with the help of an elven medicine named Soul-ease. But Athson also holds a few other secrets that he won’t reveal so easily and this leads him into trouble. As a grown man, he’s become a ranger among the elves and is sent with his mentor, Gweld, into the largely unpopulated western Auguron region. It’s here that events conspire to drag Athson unwillingly into a quest. Along the way, Athson gains several new friends and companions – some he likes and some he doesn’t. Often, Athson also struggles with what’s real and not since he losses – or forgets – his medicine several times. Other events leave Athson confused and grieving while he struggles to find the Bow of Hart. But along the way, Athson finds his secrets are hard to keep hidden. Additionally, he’ll find himself facing hidden information and danger from Corgren, Magdronu and trolls all of which will test his resolve and grasp on reality. 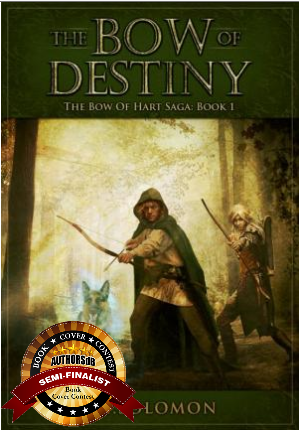 The Bow of Destiny has been selected as a semi-finalist in the Authorsdb 2015 Cover Contest (finalist selections are still pending). As such, I’ve left the book at it’s sales price of $2.99 to celebrate! 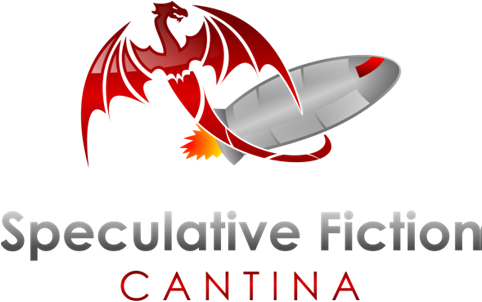 I’m excited to that I’ll be interviewed during an hour-long show today on Speculative Cantina by S. Evan Townsend at 5PM Central Time. The interview will cover The Bow of Destiny and conclude with a reading from the book by me. Because of the interview I’ve put the book on sale at all locations for just $0.99 so listen in and have a look at the book. The sale will run through Sunday after which time the price will go back to $4.99. 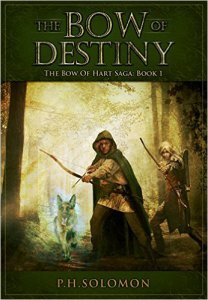 I’ve written a lot about the main cast of characters in The Bow of Destiny. 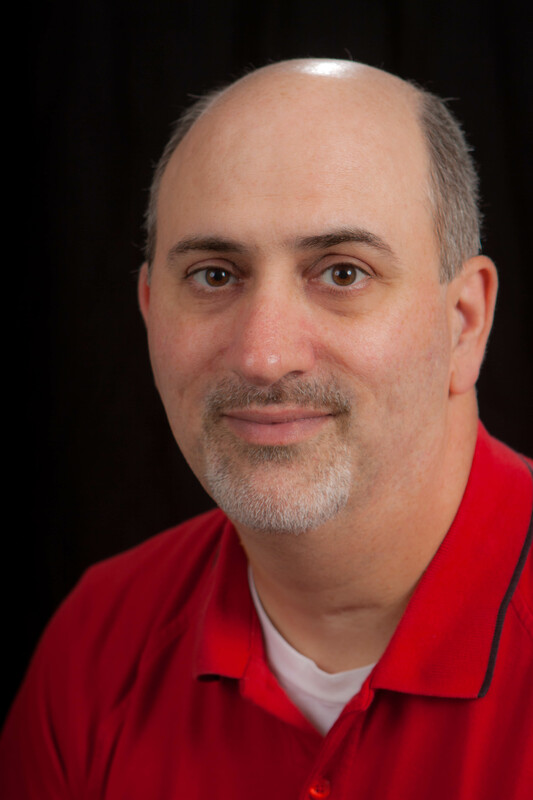 However, there are some extras that need mentioning – the ones do all the dangerous, dirty, violent, evil work. No, not the villains – at least not today. Instead, I’m referring to the trolls who inhabit Denaria. Kobolds are one type of lesser troll who stand waist and chest high and are often used as scouts and trackers. They have good noses and can be a real nuisance because of their abilities. While they are not large, they are scrappy and can attack in numbers. They are usually lightly armored with some sort of boiled hide and carry a variety of weapons from small bows to knives to short swords. Their physical appearance varies somewhat but they generally have almost dog-like snouts as well as dark, close-set eyes and have coarse hair all over their bodies. Quick and sneaky, these trolls can be a hand-full as demonstrated several times. Goblins are also lesser troll of about the same size as kobolds except they are more, well, like goblins. They’ve got tusks with less snout and and bigger, pointed ears. As you can imagine they have sharp hearing and also make great scouts when on the hunt. However, their eyesight isn’t so great during the day and they are a bit more stout which makes them a bit tougher in a fight. They are usually outfitted with hide armor and carry bows, knives and short, curved swords. Getting to the greater trolls we come to the hobgoblins which are slender and snake-like in the face with some interesting fangs. They trolls are quite intelligent so they are used for complex tasks and command of other trolls. They are quick and deadly in a fight if you don’t keep your guard up, normally using a tulwar and wearing hide armor with the occasional metal plate attached. An officer often carries a whip to enforce his commands. They stand about the height of a human or an elf in Denaria. 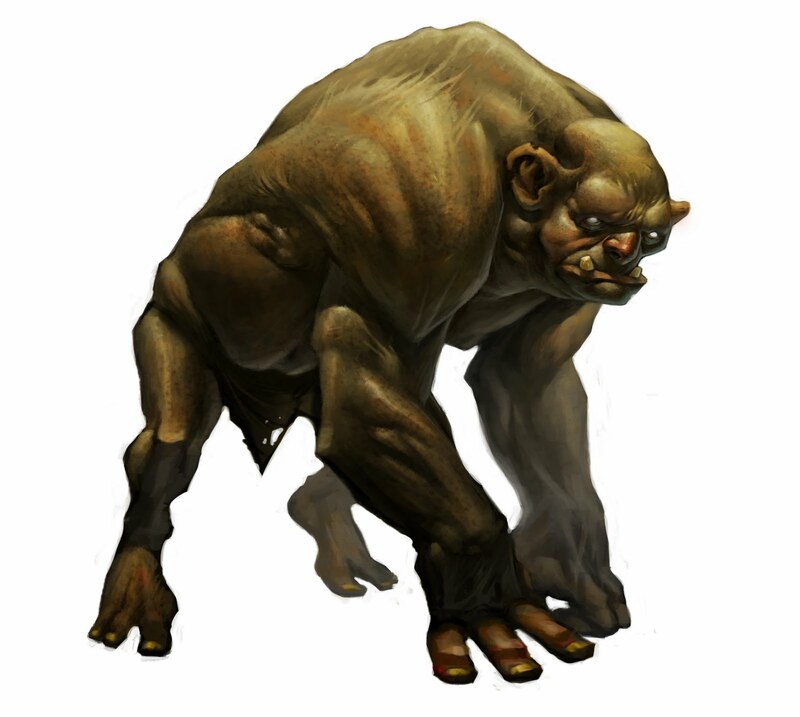 Next among greater trolls are bugbears. As you can imagine they have a bearish appearance with bigger eyes and sport tusks like goblins. Generally a bit taller than humans, they are burly and rely on their weight and strength in a fight, often using clubs for weapons. They sport shaggy fur and wear a mish-mash of hide, chain and plate armor they scavenge from victims and other trolls. Last among the greater trolls is the ogre. This creature is nearly as big as a giant like Ralda and very strong as well. They have a thick hide and are not very intelligent but tend to fight just because they seem to like it almost as much as eating. They tend to carry a large club but aren’t that accurate when using it but they are deadly if they get a grip on you. As to danger, well, you can guess that these minions like to cause trouble and never miss a chance to attack when they have a numeric advantage. Those groups without a bright hobgoblin might just attack regardless of numbers. While they can be confused and cowed with displays of power, they aren’t apt to show any mercy and just walk on by the casual traveler. They won’t just size you up and decide if you’re worth their trouble – you are always worth the trouble of an attack. That’s why it’s best to travel in numbers when in known trolls territories. 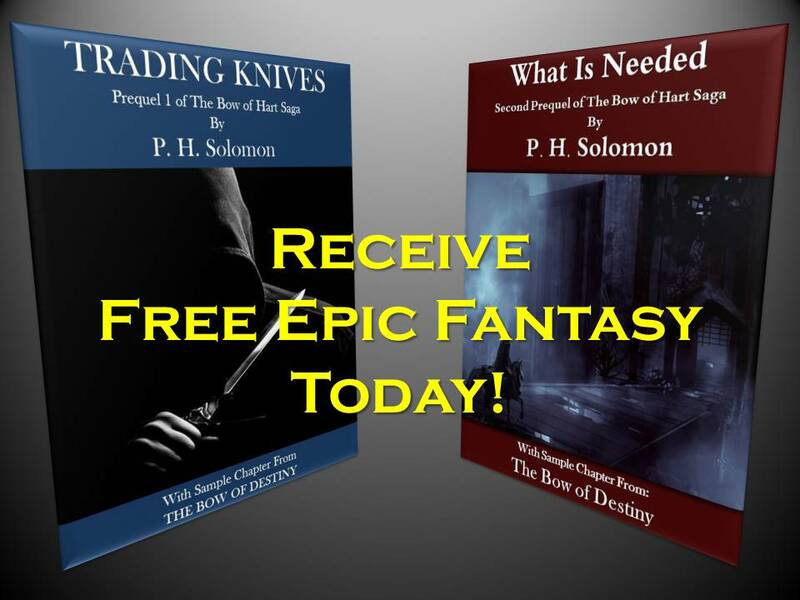 They have nasty temperaments and love a chance to pillage and plunder. As you can imagine, they make great shock troops for Magdronu and is magical captains though they aren’t often trusted with more complex objectives. They are good for one main use: mayhem. In a few other cases, the more cunning types such as hobgoblins, goblins and kobolds may be used for some specific missions for which they are specially instructed and trained. In regard to their origins, trolls have a murky history. It’s clear that they are creations of Magdronu but the details are lost in time. However, some of that story is part of the larger history of Denaria’s conflict between Eloch and Magdronu. 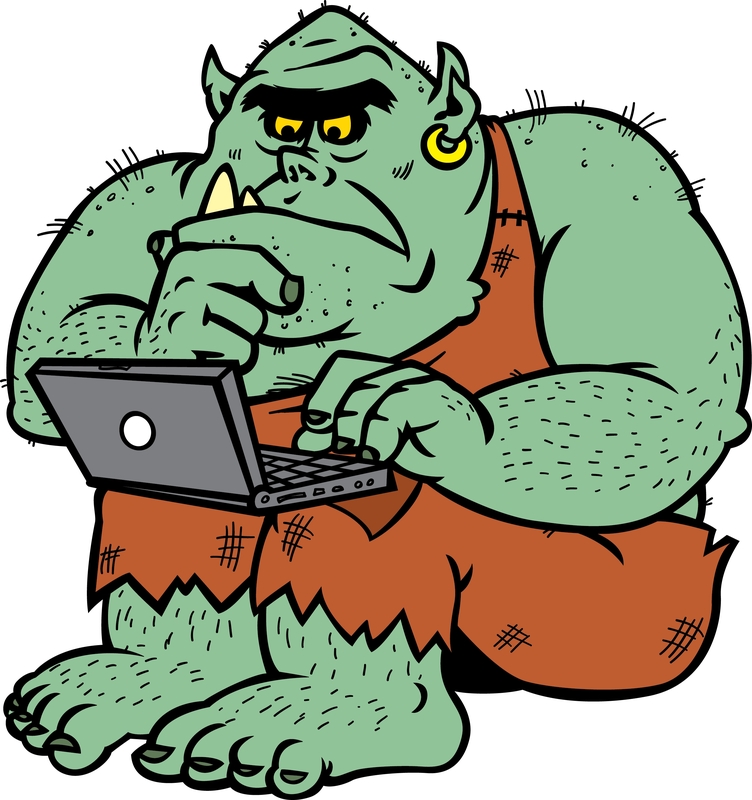 The purpose is of trolls is clear just not their origin – or is that just something to find out. 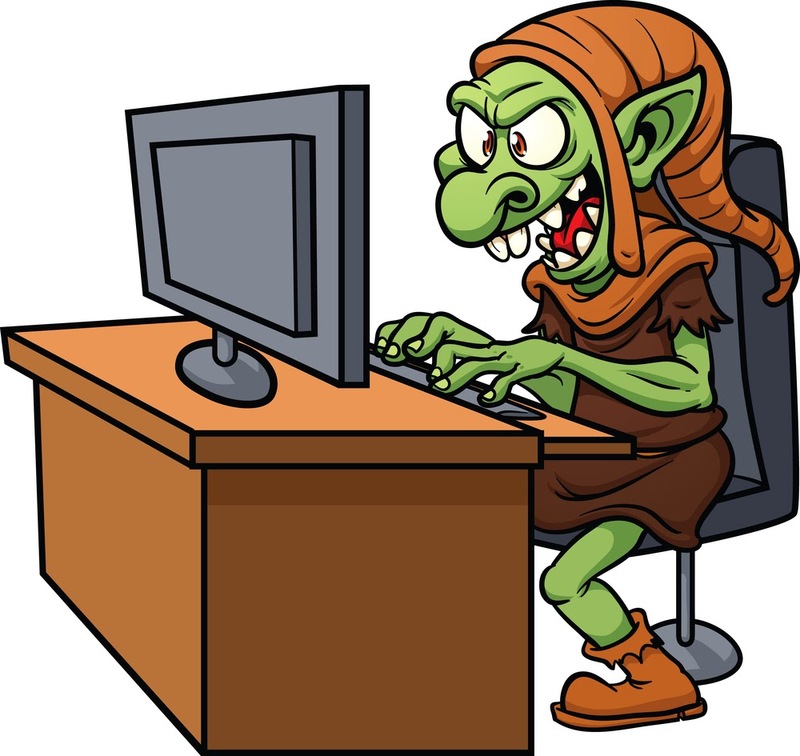 Artwork of trolls from Microsoft Clipart. The screenshot of the troll is from the very old video game Pigskin 621 AD.